It’ll start just over the bridge, picking up D.C. transplants and natives alike along the now bustling H Street Corridor and head west. Revived several decades after it was eradicated, the new D.C. streetcars will link the city in a way buses and Metro haven’t—with cross-town lines extending up to 37 miles of new and century-old trolley routes— not just making travel easier, but the city more robust as a whole. “Wherever the transport line is, that’s where the value is,” says Ken Rucker, administration director for the National Capital Historical Museum of Transportation, Inc., in Colesville, Md. When Friendship Heights and Chevy Chase got a trolley line 111 years ago, land value increased and the suburb prospered, Rucker says. The number of city residents per quarter mile will triple next to fixed guideway rails, says Harriet Tregoning, director for the District’s Office of Planning. That’s exactly what’s happening now with H Street NE: More than 125 retailers flocked to the once lackluster strip in anticipation of the new streetcars this year, Tregoning says. The proposed streetcar system—estimated to cost $1.5 billion and expected to eventually stretch from Union Station along K Street to Georgetown—will bring more density to existing neighborhoods, says Eric Madison, who worked on the streetcar project as transportation planner for the D.C. Department of Transportation (DDOT) from 2003 until 2011. And the hope is to keep attracting retailers and residents for decades to come. Urban developers look for a reason to reinvest in a neighborhood, bringing in vendors or housing complexes, says Madison, who now consults with transit systems nationwide as a contractor with the U.S. Department of Defense in Washington, D.C. So when permanent transportation infrastructure like rail or a streetcar comes along, he says, it means a steady business stream—people coming to live, going to events, clubs or restaurants. That stream can resonate for generations, Rucker says. Neighborhoods such as U Street and Florida Avenue kept booming long after the streetcars were removed. Buses followed old routes and the infrastructure such as water and gas lines and electrical wiring were already in place, ready for businesses and housing to expand, he says. And that will shape and grow the city, Tregoning says. People were leaving the trolley system in droves in favor of cars and other forms for transportation, Rucker says. City governments started thinking, “‘Why maintain [the streetcar system] when we can use buses,’” which are cheaper to run, Rucker says. After World War II, streetcar systems were phased out across the country, and officially abolished in D.C. by order Congress in 1963. The country was prosperous so more people opted for personal automobiles, Rucker says, and National City Lines—owned by Firestone, Texaco and General Motors—bought transit companies in major cities, hastening the nation’s switch to cars. “Wherever the transport line is, that’s where the value is." 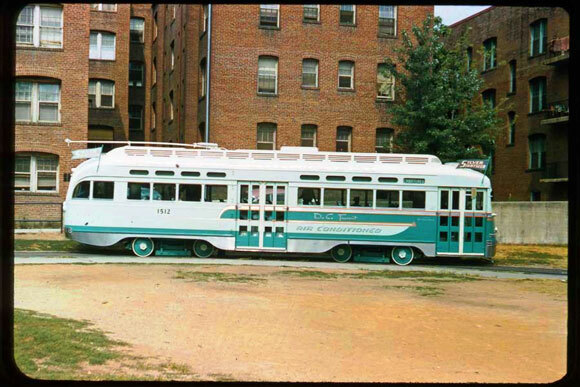 Then in the 1970s, Metro came along to replace the main trolley routes and serve D.C. suburbs such as Rockville that popped up during that era, Rucker says. The last stop of a trolley line became the epicenter for satellite communities outside of city limits, like Rockville. But Metro was never meant to help city dwellers get around, Rucker says. Then in the 1990s, then-Mayor Anthony Williams set forth a plan to bring streetcars to areas in the city that suffered from the 1968 riots or hadn’t had much investment in the last 40 or 50 years, Madison says. There were eight original corridors in Williams’ plan, H Street among them because it had heavy traffic and a healthy potential ridership along the X2 bus route, he says. There’s a lot of consistency in the new streetcar plans with the old trolley routes, but new areas will be included, namely east-to-west routes, says Dan Emerine, transportation planner for the Office of Planning. “We’re adding streetcar routes to parts of the city that never had it," he says. With an additional $400 million into a now $543 million streetcar budget for fiscal year 2014 to 2019, according to figures from the Office of Planning, D.C. is well on its way to returning the streetcars to prominence. But it’ll take time, to build and to gain popularity, Madison says. It took 30 years to build Metro to where it is now and may take just as long to rebuild the streetcar system. "We’re adding streetcar routes to parts of the city that never had it." And while the layout of the city might not change aside from construction where the streetcar rails are laid, the city’s facade will change in communities along these new lines. More neighborhoods will morph into hubs of life like in Mt. Pleasant, where a streetcar line once terminated and changed routes—the park, at Lamont Street, N.W., is now the site of the Mount Pleasant Farmer’s Market. When you get off the bus, everything is right there, Madison says. It was designed so that when you get off at the end of the day, you’ll have several destinations to which you can go—the grocery store, the dry cleaners, and so on. The next streetcar route to be built will run from historic Anacostia to Bolling Air Force Base, which is largely residential and hungry for the economic boost of community shopping centers, restaurants and bars. “The ridership is there. You just have to make sure it goes someplace people want to go,” Madison says. A previous version of this article misstated the number of miles planned for the new streetcar system. The article has been updated to correctly reflect that the planned system will comprise 37 miles of track. Elevation DC regrets the error.